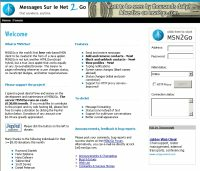 messengerFX lets MSN Messenger and Windows Live Messenger users connect to the Microsoft network via just a browser, no downloads or special settings required. “ILoveIM.com is a web messenger application that allows you to stay connected with your favorite Instant Messenger almost anywhere. You need a computer with just a browser only. There is no need to download and install any software or Java plug-ins into your computer to use ILoveIM.com Web Instant Messenger. 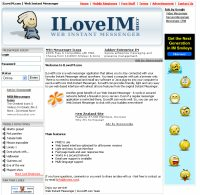 ILoveIM.com provides friendly, light and very easy to use web-based interface with almost all core features from the original Instant Messenger. Related to "Web Based Instant Messengers"